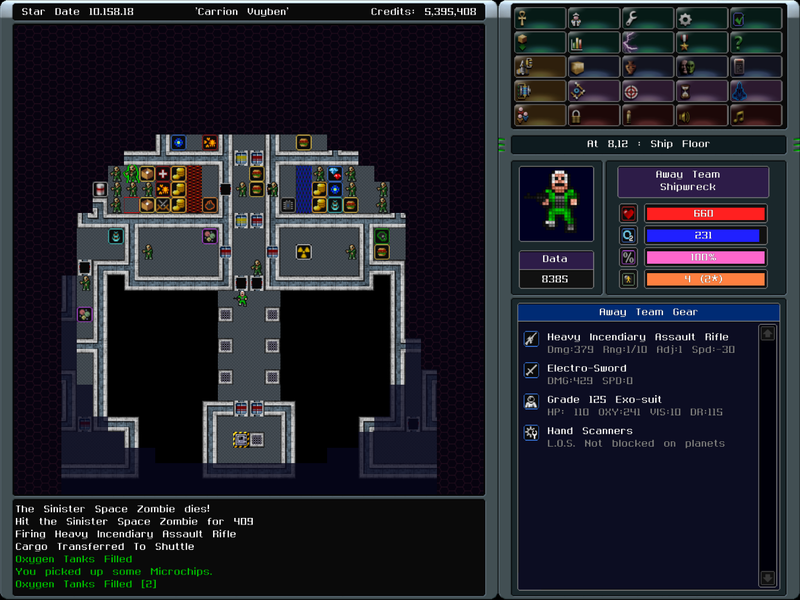 Readers who are unfamiliar with roguelikes may wish to read my introduction to the genre, and perhaps peruse a few of my previous highlights. Also, as always, you can click on images to view bigger versions. Longtime readers may remember that I posted about Approaching Infinity over a year ago, when it was just finishing up its Kickstarter campaign. The campaign was a success and the finished product is now available from Shrapnel Games (the Kickstarter campaign funded the majority of development, with the publishing deal with Shrapnel signed later). I intended to write about the game sooner because I was enjoying the various pre-release builds that were available during development, but once I started playing the official release I couldn’t stop. I had to see what the next few sectors would bring, always afraid I was missing something cool that I would want to write about. Now, having reached one of many possible endings, I can take a break to tell you about it. First things first: Approaching Infinity ditches the traditional fantasy settings of most roguelikes and instead casts the player as a starship captain, exploring new sectors of space, landing on planets, finding equipment and trade goods, and doing business with various alien races, all in a universe that keeps going forever, without limits. And it’s great. The key to Approaching Infinity’s success is its combination of simplicity and surprising depth. At first glance, it may seem to be rather slight — as I wrote in my original post, there’s no seamless universe that one might expect given the recent resurgence of the free-roaming spaceship game genre. Instead, the universe is composed of sectors, each only one screen in size, with warp gates leading ever onwards. The majority of sectors have a friendly space station along with several planets to explore, and it’s clear that sectors are meant to represent a large swath of space in a coarse-grained manner. 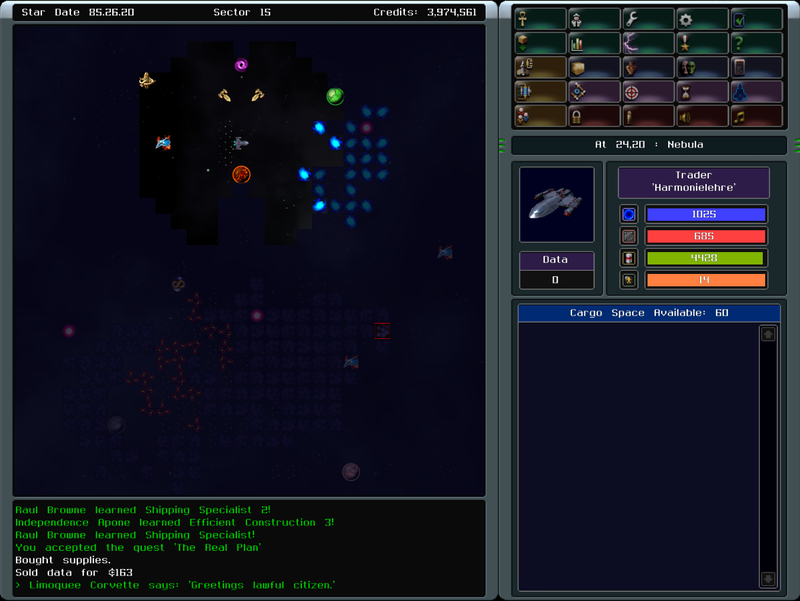 Early in the game, a ship’s sensors can only see a few spaces in every direction, and every ship or other object encountered is a major event. Ships are clearly massive, with encounters reminiscent of the slow, tactical maneuvering from science fiction classics like Star Trek, rather than the more action-packed approach of some other science fiction staples. 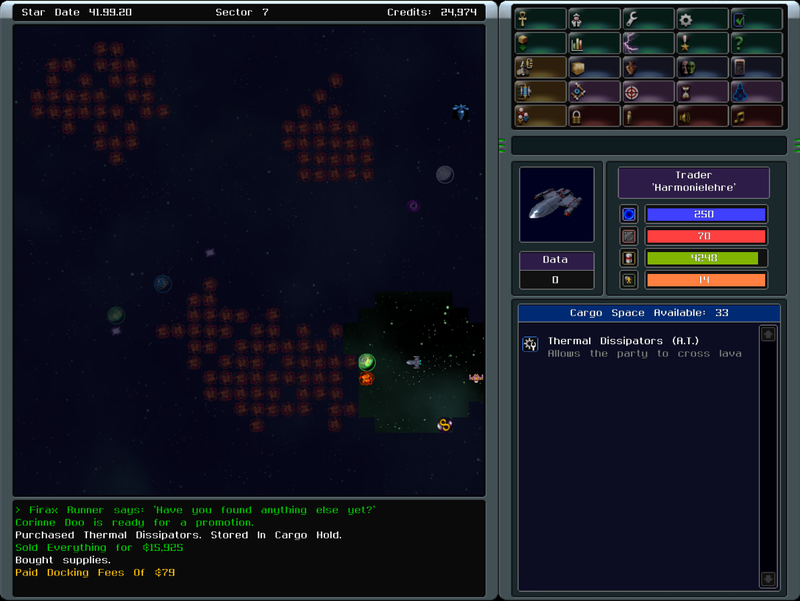 Ships can move and fire weapons each turn, but there is no way to dodge incoming fire. I quickly learned not to pick fights I couldn’t win, and to turn tail and run at signs of trouble. Nebulas provide places to hide, and asteroid belts and planets can be used to break lines of fire, but that’s more or less it for tactical options. Sometimes I was simply outgunned and couldn’t escape. Fortunately, perma-death (i.e. having to start over from scratch when killed) is optional, although I tended to play with it on. This compact space exploration is contrasted with away team missions, to planets or (often more exciting) shipwrecks. These locations also fit on a single screen — although planets can have caves of varying depth to explore too — but they feel more expansive. The controls are similar to flying the ship, but the experience is very different, dominated by concerns over oxygen. Space suits, like all the other equipment in the game, can be upgraded more or less infinitely, but the early ones have very limited oxygen supplies, so the away team must return to the shuttle often to refill. On Terran planets, the away team can open their suits when they run out of oxygen, but there’s a chance they’ll contract a nasty disease if they do so. Other, more dangerous planets do not have a breathable atmosphere, and the team will quickly expire if they run of of oxygen. In fact, some planets are so dangerous that the team must acquire upgraded space suits or they will take constant damage while exploring. Planet surfaces are scattered with trade goods, the occasional item or other special point of interest, and often hostile wildlife. I was pleased to see that most of the creatures on planets will not necessarily attack on sight (though some will), but they can get spooked and goaded into fighting if the away team gets too close. The away team also has an interesting mechanic by which injuries lower the chance of each member’s survival once the team takes off in the shuttle. If some the crew die on a mission, more will have to be hired at a space station, and losing lots of crew means the price will go up quickly. It’s even possible to lose an entire away team, which doesn’t end the game but does make your captain infamous, making it harder to hire new help. Initially, the only space stations around will be Banker stations, where one can sell data collected while exploring, a cool mechanic which means exploring new places generates some revenue. One can also buy and sell trade goods, usually to unload hauls from planets and elsewhere, as well as buy supplies and crew for the ship, purchase new equipment, and accept quests. The Banker quests are varied but clearly formulaic, typically some variant of delivery, item retrieval from space or a planet surface, or simple directive to explore a certain location. Players will quickly get into a rhythm of exploring, upgrading, and completing quests, which may lead to the false impression that Approaching Infinity is a shallow game. But soon the different alien races that have been spotted in the early sectors will make themselves known more fully. Docking at their stations reveals that there’s much more to the game. Each race has its own agenda, which the player can help or hinder. 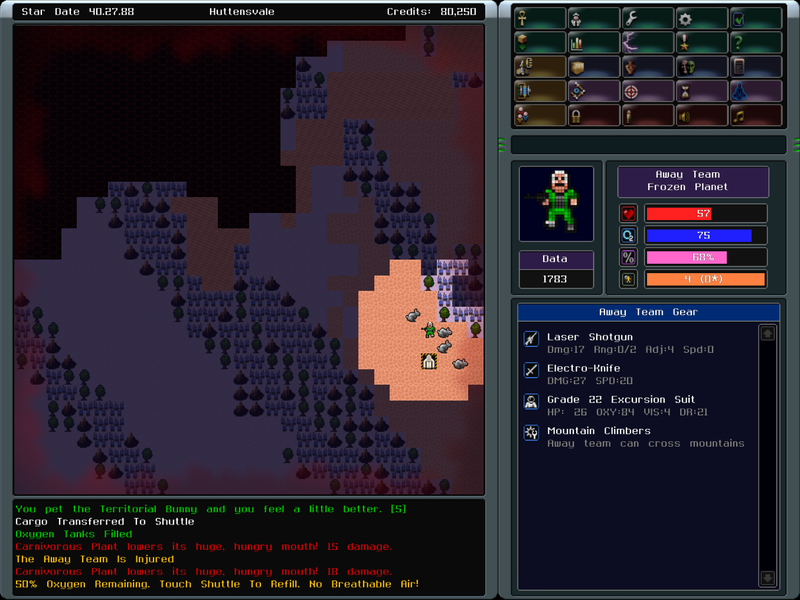 Some races will ask the player to go to war with others, so players must decide who they wish to befriend. Meanwhile, steady equipment upgrades mean that warping across several sectors at once becomes possible, and random economic events make trade runs a safe and profitable endeavor, while traveling back and forth between different alien embassies on a variety of assignments. Other aspects of the game become much more important at this stage. Officers are a particularly cool example. 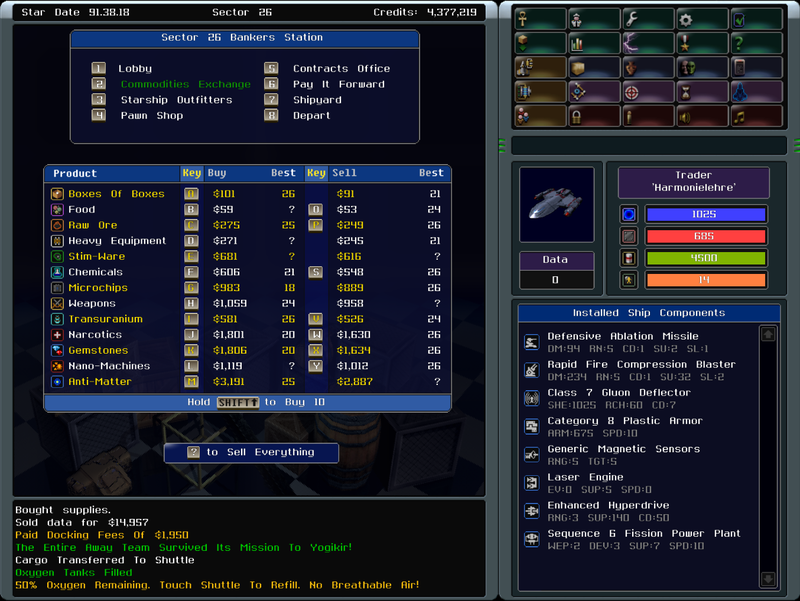 The ship’s captain acts as an officer, in fact, and players choose the captain’s specialization and starting skill at the beginning of the game. Other officers are hired or, occasionally, rescued, and bring all sorts of useful skills to the table. 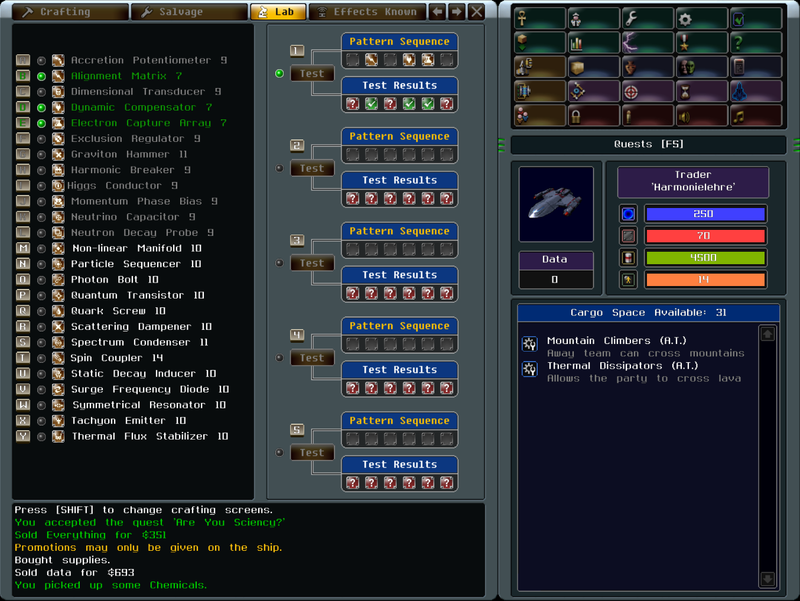 A Tactical officer might be able to boost the ship’s sensor range, while a ship’s surgeon will help make sure more crew survive each dangerous away mission. Officers gain experience in different ways based on their specializations, and can be promoted to learn new skills, although higher ranked officers will take a larger cut of the ship’s profits. Officers can be assigned to away teams as well, to bring their skills to bear on away missions or to boost their experience gain (or both). But if the away team is lost, the officer will die. Even the captain can be assigned to away team missions, but then if the team dies, it’s game over! Crafting also comes into play after the early stages of the game. Every type of equipment in the game, from ship devices to away team gear, has a unique crafting recipe of up to six parts (from a pool of 25 types), and the recipes are randomized each game. Surplus equipment can be disassembled to learn the relevant recipe, and disassembling nice stuff can boost the crew’s crafting skill, so they can make something even better. Crafting parts have fantastic science fiction names like “momentum phase bias” and “static decay inducer”. There’s even an on-board lab where players can experiment with different combinations to try and learn the recipe for something cool. The correct set of officers with appropriate skills makes crafting much easier and, eventually, the best way to get better equipment. With this new equipment the game changes drastically. Higher sensor range and away team spacesuit visibility makes exploring a lot faster, and soon more alien races are encountered, with their own special jobs on offer. High-level spacesuits have plenty of oxygen, such that it hardly presents a concern anymore when exploring planets and shipwrecks. At one point I encountered what I took to be a infinitely deep cave underneath a planet, and my away team was packing enough high-tech equipment that I was able to explore it more or less indefinitely, surviving off of oxo-algae growing in the depths. I think I got to about 60 levels below the surface before I finally gave up and returned to the ship. There were some surprises in the deeper levels, but eventually it was just a slog for more and more money and trade goods, whereas I was more interested in learning about the different alien races and seeing where their quests would lead. It was the moment I realized that I didn’t have to explore every planet I encountered anymore, as I had more money than I needed and I was building all of my new equipment myself anyway. My time was instead spent flying between various embassies, making some trade runs along the way, and learning ever more about the universe of Approaching Infinity. I thought I’d exhausted the exploration aspects of the game at this point. I’d poke into caves on occasion, but they didn’t have anything I hadn’t seen before, and I didn’t feel any particular need to explore them unless I had a specific mission to do so. I was simply doing missions for the various races, and was convinced that when I’d exhausted their quest lines I would be more or less done with the game. But again I was wrong. As I ventured farther out I started to find yet more things I’d never seen before. Flooded caverns, which require specialized equipment to explore. Giant space-borne creatures that weave webs or otherwise alter the layout of the sector. Even entirely new alien races, who I knew very little about. Eventually I decided to follow one of the races’ quest line through to its conclusion, which provided a means to dramatically alter the galaxy and reach one of many possible endings. But I needn’t have ended the game there… I could have continued ever onwards, finding new stuff and learning more about the mysterious new aliens I’d encountered. A system of unlockable achievements — which add money to the “pay it forward” system that lets players start the game with some of the wealth accumulated in previous runs — suggests that there’s much more for me to find, and I only managed to unlock a few of the fourteen unlockable ships. There are only four ships available at the start — I preferred the trader, as it has the most cargo space and its poor defenses can be upgraded in short order — but the few I’ve unlocked look pleasingly different already (reminiscent, in fact, of the unlockable ships in FTL). I’m excited for future adventures. There’s so much more to like too. The tiled graphics are simple but colorful and clear, and give an impressive visual variety to the planetary surfaces and derelict ships, such that each feels like its own unique place. The original soundtrack by ectogemia is excellent and fits the game perfectly, although I do wish tracks were played dynamically based on location instead of simply playing in order (this was apparently chosen because the relatively short time spent in each place meant track transitions happened too often and some tracks were rarely heard). Controls are kept simple, with mouse tooltips everywhere and a concise help screen that lists all the keyboard commands. A full manual is provided which explains some of the more esoteric rules of the game (crafting in particular is difficult to figure out without the manual). There are multiple difficulty settings and perma-death is optional, making things easy for newcomers and roguelike veterans alike. There are still a few small bugs on some quests, but developer Ibology is actively supporting the game and is already at work on an update that will not only fix bugs but also add some convenience features. In fact, the only real downside I anticipate for interested players is the price. Shrapnel Games cater to niche markets and price their games higher than many other publishers, but fortunately there’s a free demo (download link on the right side of that page) that lets players travel through the early sectors as many times as they wish, and gives some tantalizing hints of what’s to come farther out. I played the demo when the game was still in development and it’s a good sampling of what’s on offer in the full game, and I can attest that those who enjoy the demo will not regret the full purchase. So if you’re interested, give that demo a go, and know that there’s a lot more to find in the full game. The infinite universe awaits! 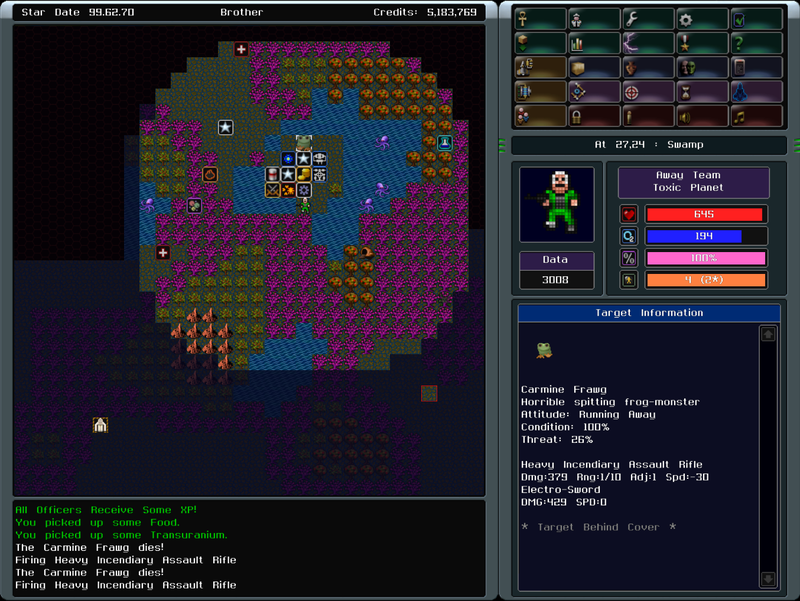 This entry was posted in Uncategorized and tagged Approaching Infinity, IBOL, Ibology, Roguelike Highlights, Roguelikes. Bookmark the permalink. Reblogged this on Approaching Infinity.